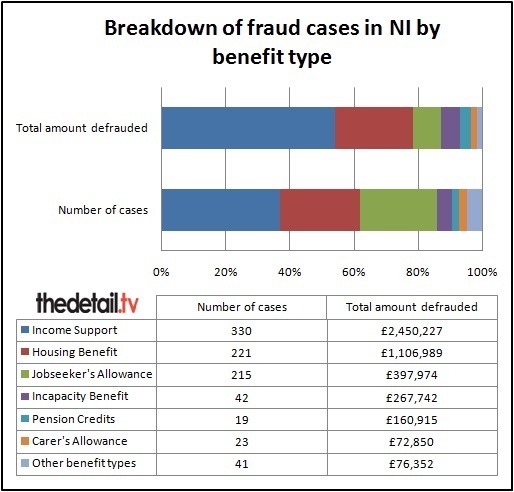 THE Detail can today reveal the full cost of benefit fraud in Northern Ireland – including striking disparities in punishments for people found guilty of illegal claims in our courts. Data obtained by us from the Department for Social Development (DSD) shows that a woman who fraudulently claimed more than £87,000 in Income Support and Housing Benefit received 200 hours community service while a prison sentence was handed down to a teenager for illegally drawing down £91 in Jobseeker’s Allowance. We can also confirm that only two people in Northern Ireland have had their social benefits reduced as a punishment for fraudulent claims since a hardline “one strike and you’re out” policy was introduced by Social Development Minister Nelson McCausland on September 1 2011. In response to a Freedom of Information request, DSD provided us with detailed information on the 592 convictions for benefit fraud secured by Northern Ireland’s courts during the year between September 1 2011 and September 1 2012. The total amount fraudulently claimed related to these convictions was £4.5m and may have accumulated over a number of years. The department has confirmed that the total level of benefit fraud estimated to be in the system in 2011 was £19m. The data provided by DSD includes the gender, age, amount fraudulently claimed and the postcode district for each person convicted of a benefit fraud crime. Nine people were jailed for benefit fraud during the year-long period covered by our request. The lowest fraud amount resulting in a prison sentence was £91. Other key findings include that the youngest person convicted of making a fraudulent claim was 19-years-old and the oldest was 71. The smallest fraudulent claim resulting in a conviction was the wrongful encashment of £58.58 in Income Support. In this case a 23-year-old man was put on probation for 12 months and ordered to pay £22 costs. The largest sum was the £87,479 fraudulent claim by a 43-year-old woman with an undeclared partner in her household. She was given 200 hours community service. The data provided by DSD does not give any information on any previous convictions which may have impacted on court sentencing. The full data released by the department is available below this article in Excel format. A press release issued on the day the new ‘one strike and you’re out’ penalty was launched in September 2011 said that the new rule could see over 1,000 claimants affected in Northern Ireland every year. The Minister explained then that the new rule would cut a claimant’s benefit, or stop it entirely, for four weeks after a person was found to have committed their first benefit fraud offence. He also claimed that it would “increase significantly” the number of people whose benefit is cut due to an abuse of the benefit system. The previous ‘two strikes’ sanction resulted in only 13 claimants having their benefits cuts in the year prior to the new rule being introduced. An important point is that the ‘one strike sanction’ only applies if the offence is wholly committed on or after 1st September 2011. It can be applied in addition to a fraud conviction, administrative penalty or formal caution, and the recovery of money fraudulently claimed. The Department for Social Development has confirmed to The Detail that no one was convicted under the one strike rule in its first year in operation. There continued to be convictions for benefit fraud but the department said that none of the 592 convictions secured between September 2011 and the end of August 2012 related to an offence which occurred solely on or after September 1 2011. We asked for an update this week and a DSD spokeswoman said that two people had now had their social security benefits affected as a result of the one strike sanction. The new penalty cannot apply to bereavement payments, retirement pension, benefits paid for children or those that cover extra costs of disability. Compiled using DSD data (Sept 2011-Sept 2012). Each conviction can involve more than one benefit type. Fraudulently claiming benefit – for example not declaring capital or assets above permitted statutory limits or claiming as a single person despite having a partner in your household. Wrongful encashment or cheque fraud. For example a benefit customer reports a lost/missing cheque payment, receives a duplicate and an investigation provides evidence that the customer had cashed both the original and the replacement cheque or manipulated the amount due on the cheque. Other fraud types include failing to report a partner is working; failing to report work while in receipt of benefit and the category of ‘other’ which includes the offences of exaggerating disability, landlord fraud and having an undeclared occupational pension. In all cases the department seeks to recover the money that was overpaid as a result of the benefit fraud. Our Freedom of Information (FoI) request included asking for details of overall figures for benefit fraud convictions for the last four years and the amount of money fraudulently claimed. 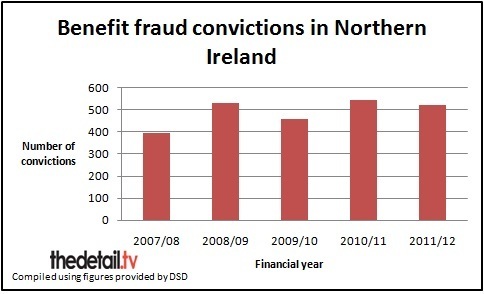 The Department for Social Development confirmed that there were a total of 2,439 court convictions for benefit fraud from the start of the 2007/08 financial year to the end of March 2012. The total amount fraudulently claimed in benefits relating to the convictions secured during this five year period was over £19m. The number of convictions was 393 during the 2007/08 financial year – compared to 519 convictions secured by the courts in the 20011/12 financial year. The amount of fraud associated with the 2007/08 convictions was £2.9m – compared to £4.5m in 20011/12. Commenting on overall benefit fraud levels in Northern Ireland, a DSD spokeswoman said: “The Social Security Agency has been successful in reducing the levels of benefit fraud from almost £61m in 2001 to just over £19m (or 0.4% of benefit expenditure) in 2011." This is the total level of fraud estimated to be within the system in a year. She continued: "In addition to the current range of activity, the agency continues to keep measures under review to maintain the momentum and strengthen further the agency’s counter fraud capabilities. “The agency will be taking forward measures including increasing the exchange of information, risk based targeting, tougher fraud penalties and faster rates of recovery. The main aim of our FoI request to DSD was to ask for a breakdown of the benefit fraud convictions in the first year since the ‘one strike rule’ was introduced by DSD on September 1 2011. We requested that the information included for each case the claimant’s name, gender, age, address, the benefit type, the crime, the amount fraudulently claimed, the court sentence/fines, any action taken by DSD (for example loss of benefit entitlement) and the date of the conviction. Most of this detail was provided for each case but some was withheld – including the claimant’s name and detailed address – to ensure that individuals were not identified. The department does regularly name people convicted of benefit fraud on its website but said this is done as soon as possible after the conviction and that the names are removed after one month. 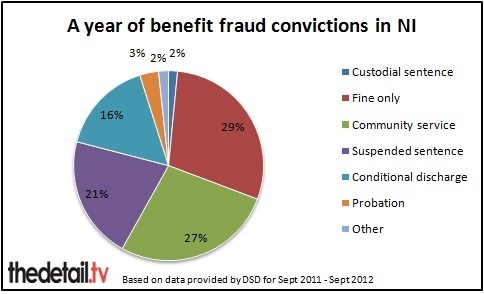 The Department for Social Development provided a detailed breakdown of the 592 convictions for benefit fraud between September 1 2011 and September 1 2012. The main outcome of the fraud conviction cases were: fine only (173 cases), community service (162), suspended sentence (125), conditional discharge (96) and probation (20). The data does not include prosecutions for child maintenance fraud as the Child Maintenance and Enforcement Division have their own fraud investigations team. To see a previous article by The Detail on maintenance arrears owed to children in Northern Ireland, click here. 261 of the offenders were female and 331 male. The youngest person convicted of making a fraudulent claim was 19 and the oldest was 71. The smallest benefit fraud amount claim resulting in a conviction was wrongful encashment of £58.58 in Income Support. In this case a 23-year-old man was put on 12 months probation and ordered to pay £22 costs. The largest amount was a £87,479 fraudulent claim for Income Support and Housing Benefit. This resulted in a 43-year-old woman with an undeclared partner in her household being given 200 hours community service. The average amount defrauded was £7,642. 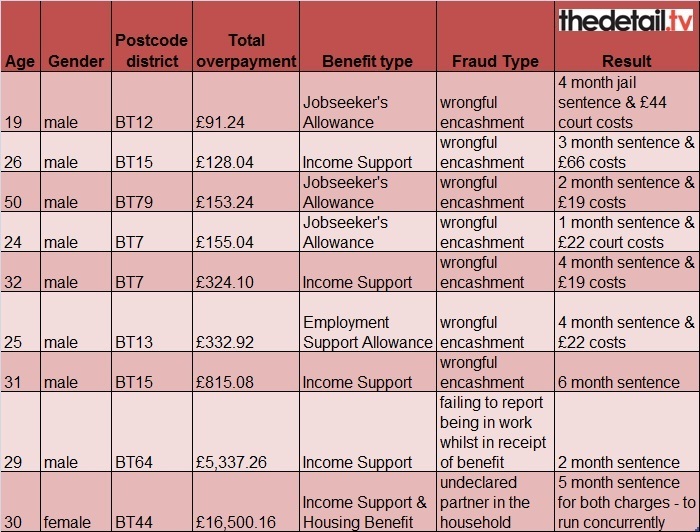 In some postcode districts, there were no benefit fraud convictions during the year covered by our request. The largest number of convictions was in BT12 where there were 55 convictions and over £418,000 was fraudulently claimed in benefits. This is in Belfast and includes the Falls Road, Sandy Row and The Village areas. There were also 49 convictions of people living in the BT48 area of Derry, which includes Ballynagard, Coshquin, Rosemount, The Collon and Culmore. Of those convicted, only six (1%) were teenagers, 27% were in their 20s, 26% were aged between 30 and 39, 24% were in their 40s, 15% in their 50s and 7% were aged 60 and over. The information released by DSD includes that nine people were jailed for benefit fraud during the period covered by our request – all in 2012. The lowest fraud amount resulting in a prison sentence was £91. This Jobseeker’s Allowance overpayment resulted in a 19-year-old man being sent to prison for four months. He lived in the BT12 district of Belfast. The highest amount resulting in a prison term was £16,500 claimed in Income Support and Housing Benefit for a single person who was LTAHAW (living together as husband and wife). This resulted in a 30-year-old woman being jailed for five months. She lived in the BT44 area which covers Portglenone, Carnlough, Glenarm, Clogh Mills, Rasharkin, Glenariff/Waterfoot, Cushendun, Cushendall, Dunloy, Loughguile, Glarryford, Ballymena. Full details of the cases resulting in imprisonment are below. There were some stark differences in the outcomes for people convicted of benefit fraud who lived in the same postcode district. For example BT66 covers the areas of Derryadd, Derrytrasna, Dollingstown, Donaghcloney, Lurgan, Waringstown and Craigavon. A 27-year-old woman from BT66 was given 80 hours community service after she was convicted in January 2012 of claiming £27,163 in benefits (Income Support and Housing Benefit) when working. Seven months later, a 29-year-old man living in the same postcode area was given a four month prison sentence (suspended for 12 months), a £200 fine and had to pay £19 costs when he was convicted of the wrongful encashment of just £218 in Jobseeker’s Allowance. BT7 covers the Ormeau area of Belfast. A 24-year-old man with an address in BT7 was jailed for a month and had to pay £22 court costs for the wrongful encashment of £155 in Jobseeker’s Allowance. In contrast, a 49-year-old man living in the same postcode district was given an 18 month prison sentence, suspended for three years, for claiming £85,993 in benefits (Income Support and Housing Benefit) when he was working. Information on any previous convictions people may have was not requested or provided. The Northern Ireland Audit Offices examines many types of fraud in Northern Ireland through the National Fraud Initiative (NFI). The report of the second NFI exercise to be undertaken in Northern Ireland was published in June 2012. It identified over £24m in fraud, error and over-payments for 20010-11. One hundred and seven bodies participated in NFI, including central government bodies, agencies, non departmental public bodies, local councils and health sector bodies. They were asked to provide data sets including payroll, pensions, trade creditors, housing benefit, blue badges, concessionary travel passes, taxi driver licenses, private supported care home residents and domestic rates. The NFI used a sophisticated computerised data matching system to compare sets of data against other data sets held by the same, or another, body, in order to highlight matches which could indicate that fraud or error exists. The key findings included 333 cases of suspected housing benefit fraud, 489 cases of suspected domestic rates evasion, over 40 cases of error in pension payments and thousands of blue badge and travel passes matched with deceased people.